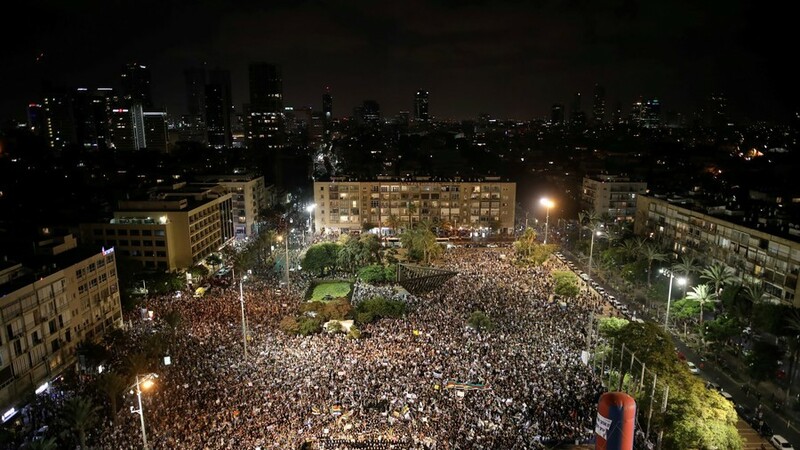 Tens of thousands are protesting in Tel Aviv against ‘nation-state’ law that prioritized Jewish values in Israel and has been criticized as discriminating sparking local and international condemnation. Protesters have been holding signs "If we are brothers we must be equals" and "Our force is in our unity – the nation-state law differentiates between us," according to the Haaretz newspaper. They were waving Israeli and Druze flags. The protests are led by the Druze community, an Arabic speaking minority whose members hold high positions in Israeli army and politics, that is says the new law discriminates against other groups in the country. The legislation, passed by the Knesset in July, downgrades Arab language status and limits the right to self-determination to Jews. Prime Minister Benjamin Netanyahu attempted to stop the protest by holding talks with Druze leaders but failed. "He had no intention of listening us, the officers who have a position contradictory to his own," Brig. Gen. (res.) Amal Asad Asad said after the meeting on Thursday who previously called Israel “apartheid state” over this law. The law, which had been in the works since 2011, has sparked a wave of protests, which spilled over the Israeli border and angered the influential Jewish diaspora in the US. The critics of the bill argue that such wording makes some 1.8 million Israeli Arabs, a quarter of the population, second-class citizens. “This law doesn’t include elements that are essential for proper normal life in this country,” Amir Kneifas, one of the Druze community leaders said. Supporters of the law say it’s not different from what is written in Israeli constitution and refers to the symbols of the country only. “This is the homeland state of the Jews,” Middle East expert Reuven Berko told RT, noting that no one in Europe protests against crosses on national flags.